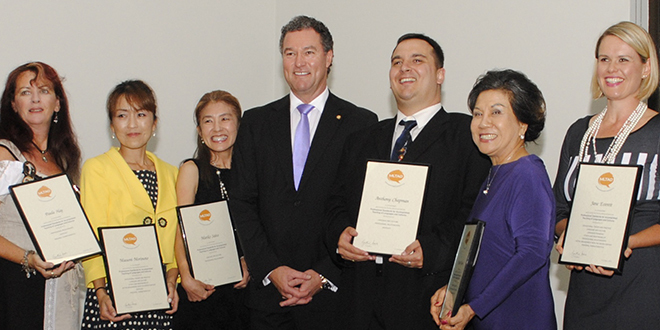 Rice day: Masumi Morimoto (second from left) receives her award in Brisbane. She is with State Minister for Education, Training and Employment, John-Paul Langbroek (fourth from left) and other award recipients. A ST Andrew’s College Japanese language teacher’s innovative project Have a Rice Day has won her an award for exemplary teaching practice. Masumi Morimoto was one of two Japanese language teachers at the college to gain recognition in the recent the Modern Language Teachers Association of Queensland awards for Exemplary Teaching Practice in Languages and Cultures. Fellow Japanese language teacher Alison Von Dietze was awarded a certificate in the same field. Ms Morimoto’s project Have a Rice Day was awarded for incorporating the principles of sustainability into her Japanese language program. Her program was nominated and accepted as fulfilling the requirements of the Australian Federation of Modern Language Teachers’ Associations Professional Standards for Accomplished Teaching of Languages and Cultures. Ms Morimoto attended the MLTAQ inaugural awards night in Brisbane last month to receive her award.